Bring a big pot of water (with about a teaspoon of salt) to boil, and add the pasta. After five minutes, add the beans and boil briskly another five minutes. Place fresh peas in bottom of colander and drain pasta and beans over that and then run cold water over all to cool. While pasta and beans are cooking, chop herbs, garlic (or scapes) and place in the bottom of a large bowl. Mix in oil (2-4 tablespoons or to taste), lemon juice (about 2 tablespoons), Balsamic vinegar (1-2 tablespoons), mustard, peppadews (and a bit of their liquid if desired), the peas if you are using frozen and the olive slices. Mix well with a fork. Fold in pasta and green beans and then fold in slivered spinach. Season to taste with salt and pepper. Chill until serving time. This should serve four. 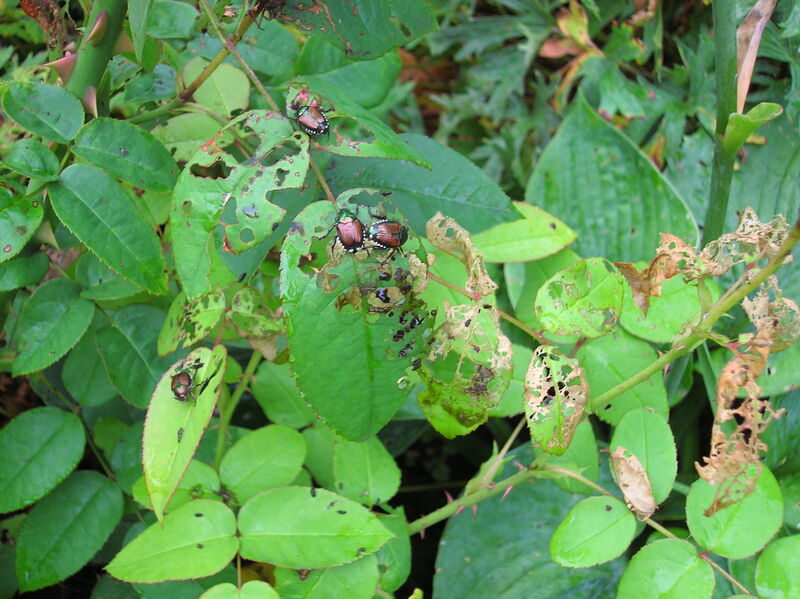 Out in force now, those alien invaders Japanese beetles can be found chewing up rose buds, blooms and foliage, hollyhocks, raspberries and even peach tree foliage. Early morning and late afternoon “sweeps” of the garden will find these pests shredding uppermost foliage and inside rose blooms and buds. While spraying might be effective for those insects present, it is no magic bullet and broad spectrum pesticides often do more damage that good. Even so there are alternatives. 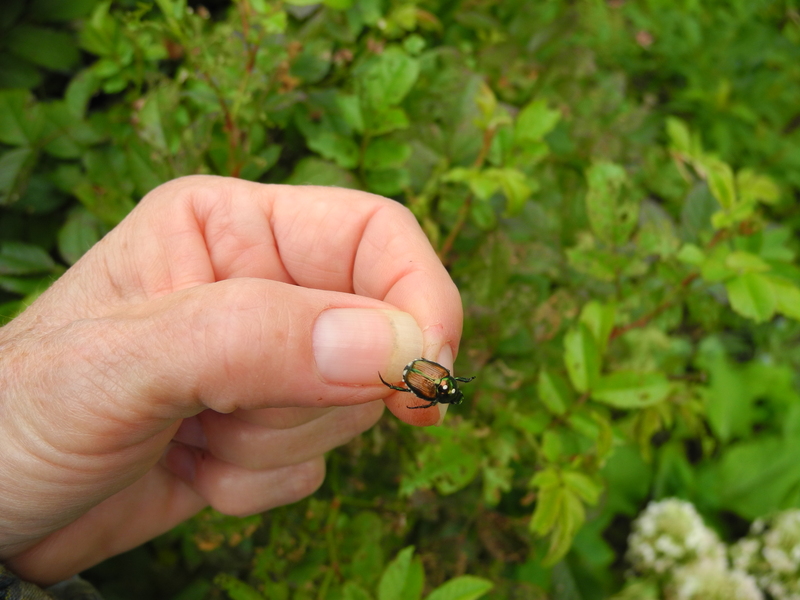 Though it seems we have no allies in this ever-increasing battle, there is a small insect, the Tachinid fly that lays its eggs right behind the Japanese beetle’s head. Look for a tiny opaque white dot there, and spare that beetle to enable the parasitic insects to hatch out (increasing their numbers to go on and attack more beetles) and finish off the beetle. If you see no white spot, you have a couple options. 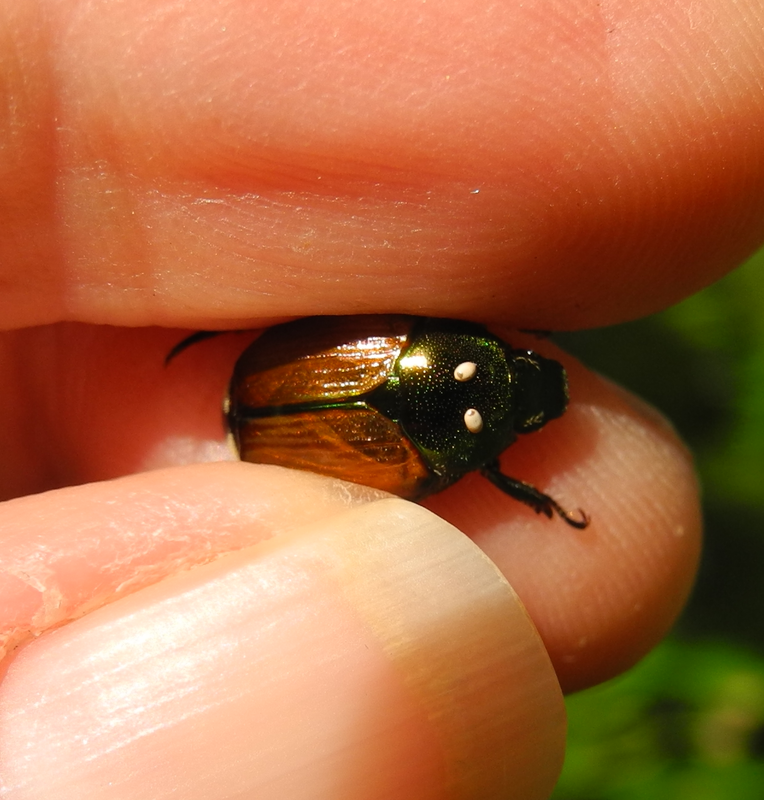 Working quickly (for Japanese beetles have the annoying habit of dropping to the ground when they sense danger and cannot be seen once there, or they fly away) either squash them with your fingers (Ick! But they don’t bite) or take a widemouth jar half full of water with a few drops of dish detergent with you, and lightly tap the beetles into the jar where they will eventually drown. If you do this faithfully for the next few weeks, you should be able to reduce the damage and beetle populations. Happy hunting. This summer we’ve taken a page out of gardening history and are trying a variation of the “three sisters” Native Americans’ planting technique. 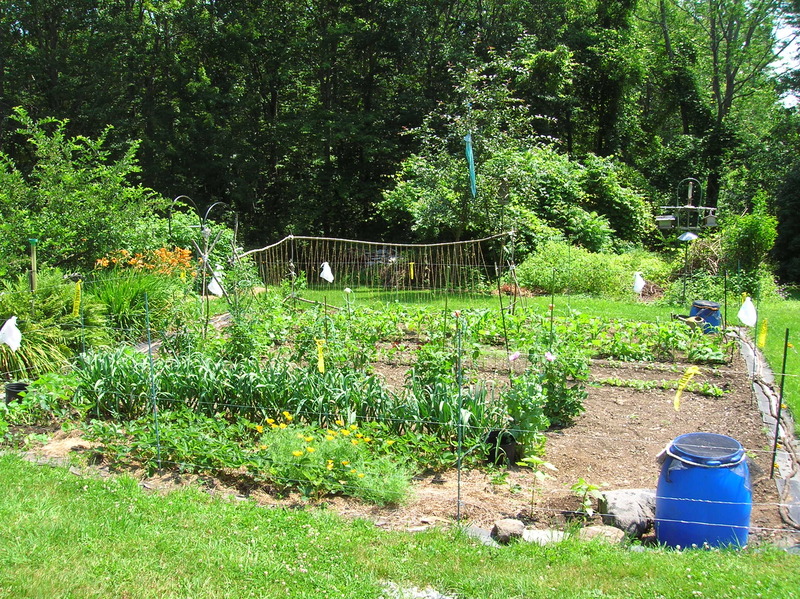 The trio involves corn, climbing (or pole) beans and squash. The corn provides support for the beans, which in turn fix nitrogen in the soil for the corn. The squash shades the “feet” of the corn and the beans, preserving moisture for all three to thrive. Pretty smart, eh? Ordinarily the three are planted together, often in mounds. Instead we tried two rows of corn with beans planted in-between. Between the two rows we made a series of mounds where the squash was planted. The corn is almost a foot tall now, and the beans are already out-pacing the corn, though it all looks pretty good so far. The squash is growing well, ready to do its part in the scheme.